Now that you have your simple, green cleaning products, let’s create a list! Lists are what keep my life in order. Lists remind me what I need for the upcoming day, as well as, allow me to see my personal goals for an extended period of time. Plus, who doesn’t like to mark things off lists? It just feels good! Below is a list of items in our house that we tend to forget about such as fire detectors, air conditioners, etc. 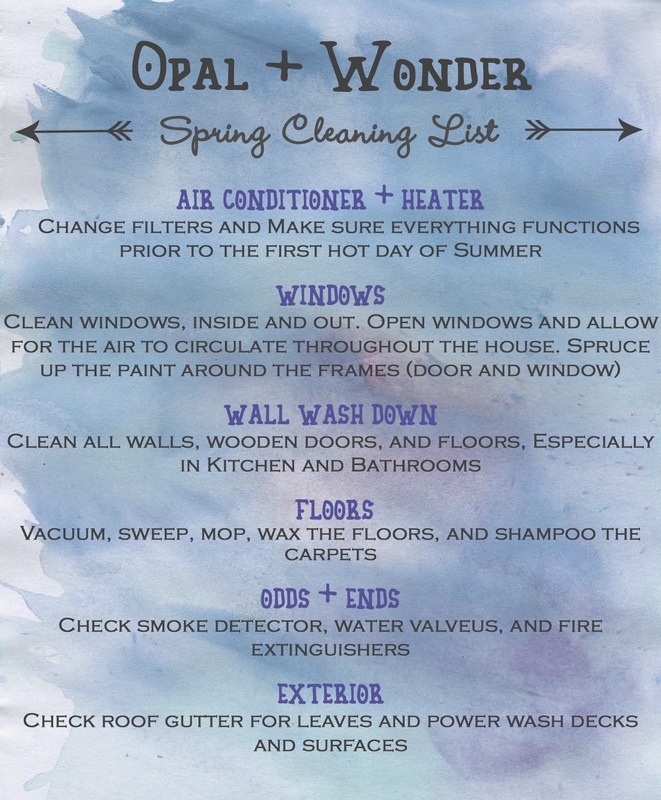 This will help get your Spring Cleaning week started. Add it to your daily cleaning list and voila- you have the ultimate cleaning list! Have fun crossing it off! **If you want to remove mildew from floors by spraying a mixture 1/2 cup of chlorine bleach, 1/3 cup powered laundry detergent and 1 gallon of water. You will wash from the base up the wall. Please be sure to wear gloves when using cleaning products. ** Pick a Saturday to shampoo the carpets. Use that day as a family day, and take the family on a hike. Go outside and enjoy the day together. Refer to our recent post, Spring Cleaning: Simple and Green Recipes, for everything you need to knock out this to-do list the green way! Cleaning the house can be quite hectic. So having a list is really helpful, so that people have a guide on which to finish first and whatnot, instead of trying to do all of it at the same time. And in my opinion, it’s good that you listed the AC unit and heater on your number 1 spot, since these are the ones that others tend to forget, yet people rely on them heavily, especially during extreme climate conditions. Thanks for sharing! Spring cleaning is definitely a lot easier if you have a list on hand. You’ll be sure to go through all the things you need to clean, without worrying if you missed an area. Anyway, thanks for sharing this with us, and I hope a lot of your readers could make use of it. Have a great day!